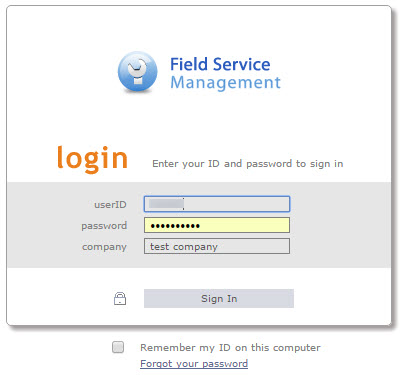 Intuit Field Service Management (IFSM), powered by Corrigo, is a web-based work order scheduling and dispatching system designed for service, installation and repair companies. IFSM integrates with US versions of QuickBooks Online (QBO) and all US versions of QuickBooks Desktop (Pro/Premier/Enterprise). It also has a mobile app for the field technician’s Apple and Android mobile devices. Intuit and Corrigo share support coverage for Intuit Field Service Management. To save time and prevent misdirected contacts, visit Support/FAQs: Intuit Field Service Management. To sign up for your free seat (one included with each QuickBooks Desktop Enterprise subscription), or to purchase additional seats, please call our Sales Team at 844-832-2901 (Mon-Fri, 6 am to 5 pm PT) and choose option 1. Note: See Intuit Field Service Management website for pricing per seat. After processing your IFSM, you can expect the following from our partner Corrigo within the next 8 business hours. An email of your login information and a confirmation that your subscription is ready. A follow-up call to ensure you are able to log in and get started. Upon activation, visit https://qblogin.corrigo.com/ to access your account. If you do not receive a follow up from Corrigo, you need to get started sooner, or you have questions about Intuit Field Service Management, please call Corrigo Pro Specialist Team at 800-517-2871 (Mon-Fri, 8 am to 8 pm ET) or email them at support@corrigo.com. If you use the When Invoices are copied use QuickBooks Online numbering option, the invoice in QBO will be the next invoice inside QBO. If you use the When Invoices are copied use Service Management numbering, make sure any manually-created invoices in QBO have a different number format than the invoices syncing from IFSM. If there is an existing invoice number in QBO that is identical to one syncing from IFSM, the invoice in QBO will be overwritten by the new invoice from IFSM. The database structure differs between QuickBooks Desktop and QuickBooks Online. Subscribers of IFSM should pay attention to support documentation prior migrating QuickBooks Desktop data to QBO. Please follow these steps in the Intuit Field Service Management site prior to migrating your QuickBooks data from QuickBooks Desktop to QBO. Failure to follow these steps will result in duplicated Items and possibly lost data in your Intuit Field Service Management account “IFSM”. Questions? Contact Corrigo Technical Support at 800-517-2871.